Reviews: Economist (25 March 2010), International Affairs (11 May 2010), Ny Tid (11 June 2010), Times Higher Education (1 July 2010), Le Monde Diplomatique (August 2010), Weekendavisen (26 August 2010), Asia Times (4 September 2010), the Middle East Journal (25 October 2010), al-Ghad (26 November 2010), Babylon - Nordic Journal of Middle East Studies (1 December 2010), Academische Boekengids (22 December 2010), al-Majalla (14 January 2011), OpenDemocracy.net (10 February 2011), Politique Etrangere (21 March 2011), Journal of Politics (April 2011), Journal of Arabian Studies (21 June 2011), British Journal of Middle Eastern Studies (18 August 2011), and Terrorism and Political Violence (6 December 2011). Al-Qaida dans le texte [with G Kepel, S Lacroix, O Saghi and J P Milelli], Paris: Presses Universitaires de France, 2005; German edition: Al-Qaida: Texte des Terrors, Piper Verlag, 2006; Italian edition: Al-Qaeda. I testi, Laterza, 2006; English edition: Al Qaeda in its own words, Harvard University Press, 2008. Jihadi Culture: The Art and Social Practices of Militant Islamists (Cambridge University Press, 2017). On the New York Times "Reading List for a Better Understanding of Events in Saudi Arabia". "Abdallah Azzam and Palestine", Die Welt des Islams 53, 3-4 (9 December 2013). Primary sources available here. "The Palestine Effect: The Role of Palestinians in the Transnational Jihad Movement "(with Joas Wagemakers), Die Welt des Islams 53, 3-4 (9 December 2013). Primary sources available here. "Should I Stay or Should I Go? Explaining Variation in Western Jihadists' Choice between Domestic and Foreign Fighting", American Political Science Review 107, 1 (2013). "The Ideological Hybridization of Jihadi Groups", Current Trends in Islamist Ideology 9 (2009). "Islamist violence and regime stability in Saudi Arabia", International Affairs, 84, 4 (2008). 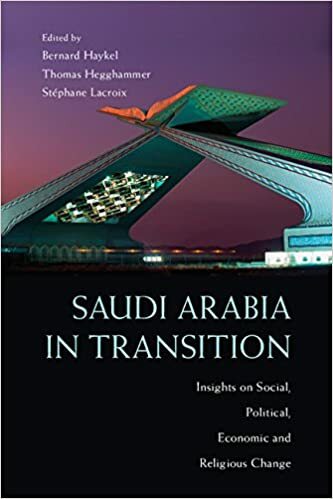 "Rejectionist Islamism in Saudi Arabia: The Story of Juhayman al-Utaybi Revisited" [with S Lacroix], International Journal of Middle East Studies, 39, 1 (2007). "Combattants saoudiens en Irak", Cultures & Conflits, 64 (2007). "Terrorist Recruitment and Radicalisation in Saudi Arabia", Middle East Policy, 13, 4 (2006). "Global Jihadism After the Iraq War", Middle East Journal, 60, 1 (2006). "Jihadi Strategic Studies: The Alleged Al Qaida Policy Study Preceding the Madrid Bombings" [with B Lia], Studies in Conflict and Terrorism, 27, 5 (2004). "Jihadi Salafis or Revolutionaries: On Religion and Politics in the Study of Islamist Militancy", in R Meijer (ed), Global Salafism: Islam's New Religious Movement, (London/New York: Hurst/Columbia University Press, 2009), pp. 244-266. "Family Values", review of Najwa bin Laden et al, Growing up Bin Laden, in The National, 7 January 2010.
Review of Laurent Murawiec, The Mind of Jihad, in The Times Higher Education Supplement, 12 June 2009. "The Struggle Within", review of the documentary film Recycle, in The National, 12 February 2009. "Until the End of Time", review of Jean-Pierre Filiu, L'Apocalypse dans l'Islam, in The National, 15 January 2009. "Jihadi Studies", Times Literary Supplement, 2 April (2008). Review of Dore Gold, Hatred's Kingdom: How Saudi Arabia Supports the New Global Terrorism, in The British Journal of Middle Eastern Studies, 34, 2 (2007). The Failure of Jihad in Saudi Arabia, West Point: Combating Terrorism Center, 25 February 2010. Saudi Militants in Iraq: Backgrounds and Recruitment Patterns, Kjeller: FFI, 2007. Paths to Global Jihad: Radicalisation and Recruitment to Terror Networks [with L Bokhari, B Lia, P Nesser and T Tønnessen] Kjeller: FFI, 2006. Al-Qaida Statements 2003-2004: A Compilation of Translated Texts by Usama bin Ladin and Ayman al-Zawahiri, Kjeller: FFI, 2005. Saudi Arabia Backgrounder: Who are the Islamists? [with S Lacroix], Brussels: International Crisis Group, 2004. The Iraq Hostage Crisis: Abductions in Iraq, April-August 2004, Kjeller: FFI, 2004. Restoring Peace or Provoking Terrorism? [with Å Kjøk, A Hansen and J Knudsen], Kjeller: FFI, 2004. "Calculated Caliphate", Lawfare Blog, 6 July 2014. "Jihadism: Seven Assumptions Shaken by the Arab Spring", Project on Middle East Political Science, 3 February 2014. "Syria's Foreign Fighters", ForeignPolicy.com, 9 December 2013. "Terrorism" and "Suicide", in G Bowering et al (eds. ), Princeton Encyclopedia of Islamic Political Thought, Princeton University Press, 2012. "Deconstructing the Myth about Al Qaeda and Khobar," CTC Sentinel 1, 3, February 2008. "Weakened al-Qaida shifts to oil targets", Oxford Analytica Daily Brief, 9 November 2007. "Saudi Arabia: Terror threat reduced - for time being", Oxford Analytica In-Depth Analysis, 28 February 2007. "To Combat ISIS, Europe Must Do More to Police Social Media", New York Times (Room for Debate), 20 November 2015. "Will ISIS 'weaponize' foreign fighters? ", CNN.com, 16 October 2014. "European foreign fighters in Syria", transcribed oral testimony, British Parliament, 11 February 2014. "Number of foreign fighters from Europe in Syria is historically unprecedented. Who should be worried? ", WashingtonPost (Monkey Cage Blog), 27 November 2013. "The Future of Anti-Western Jihadism", testimony before the House Committee on Foreign Affairs, Subcommittee on Terrorism, Nonproliferation and Trade, Washington, DC (18 July 2013) (see here for video). "How Syria's Civil War Became a Holy Crusade" (with Aaron Y. Zelin), ForeignAffairs.com, 7 July 2013. "The Riyadh Bombings: Ten Years and Ten Lessons Later" (in Arabic), al-Sharq al-Awsat, 13 May 2013 (English version here). "The Rise of the Macro-Nationalists", New York Times (Sunday Review), 31 July 2011. "The case for chasing al-Awlaki", ForeignPolicy.com, 24 November 2010. "Why Does Al-Qaeda Have a Problem With Norway? ", TheAtlantic.com, 13 July 2010. "Lady Gaga vs. the Occupation", ForeignPolicy.com, 31 March 2010. "Yemeni Threat in Saudi Arabia", ForeignPolicy.com, 26 March 2010. There is nothing soft about Saudi counterterrorism, ForeignPolicy.com, 11 March 2010. The Big Impact of Small Footprints, ForeignPolicy.com, 11 November 2009. Irreparable damage, ForeignPolicy.com, 4 May 2009. "Osama Bin Ladin's True Priorities", The Guardian, 4 December 2007. "Abu Musab al-Zarqawi: Death of an Icon", commentary posted on www.opendemocracy.net, 8 June 2006. "The Origins of Global Jihad: Explaining the Arab Mobilization to the 1980s Afghan Jihad", Harvard Kennedy School, 22 January 2009. "Al-Qaida in Saudi Arabia and Yemen", Carnegie Endowment for International Peace, 24 November 2008. "Orthodoxy and Radicalism in Saudi Arabia", CSIS Congressional Forum on Islam, 3 March 2008. "Political Violence in Saudi Arabia: The Rise and Fall of al-Qaida on the Arabian Peninsula", Princeton University, 2 March 2007. "Strategic Studies in Jihadist Literature", Middle East Institute, Washington DC, 17 May 2006. "Skandinavias første jihadister", Babylon 2 (2018). "Irak-konflikten og radikal islamistisk ideologi", Internasjonal Politikk 4 (2004). "En oversikt over islamistiske terroristgrupper," i B E Rasch (red. ), Islamistisk terrorisme, Oslo: Abstrakt, 2005. "Islamsk terror og krigen mot Irak," i B E Rasch et al (red. ), Spillet om Irak, Oslo: Abstrakt, 2004. Dokumentasjon om al-Qaida: Intervjuer, kommunikéer og andre primærkilder, (Kjeller: FFI, 2003). Atommateriale, gass og mikrober som terrorvåpen? En undersøkelse av terrorgruppers interesse for og bruk av ikke-konvensjonelle våpen [med B Lia, R-I Vogt-Andresen, Å Kjøk and L Bokhari] (Kjeller: FFI, 2002). "Norske fremmedkrigere i går og i dag", Norsk statsvitenskapelig tidsskrift 30, 4 (2014). "Al-Qaida ti år etter", FFI-Fokus 1 (2011). "Sikkerhetspolitiske implikasjoner av opprørene i Midtøsten", DNAK Kortinfo 1 (2011). "Al-Qaidas rekruttskoler," Norsk militært tidsskrift 178, 2 (2008). "Palestina og global jihad," Babylon 4, (2004). "Al-Qaida etter Afghanistan", Kortinfo 12 (Oslo: Den norske atlanterhavskomité, 2002). "Skandinavias ukjente jihad-historie", VG, 8. februar 2019. "Hjelper politibevæpning mot terror? ", VG, 4. desember 2014. "Det kom aldri noen penger til å forske på høyreekstremisme etter 22. juli", Aftenposten, 12. november 2014. "IS og fremmedkrigerne", Romerikes Blad, 31. oktober 2014. "Ekstreme fremmedkrigere", Forsvarets forum, 24 June 2014. "Hvem skal betale for forskning på høyreekstreme?" Forskning.no, 11. januar 2014. "Ensporet terrorforskning? ", Aftenposten, 9 August 2011. "Truer verden med terrorangrep" [med B Lia], Dagsavisen, 15. august 2009. "Saudi-Arabias terrorismeproblem", Aftenposten, 18. juni 2004. "Mer terror etter en krig mot Irak? ", Aftenposten, 20. februar 2003. "Selvmordsaksjoner i Oslo?" [med K Vogt], Aftenposten, 23. april 2002. "Bomber mot terrorisme? ", Aftenposten, 10. november 2001. Steve Coll, The Bin Ladens: An Arabian Family in the American Century, New York: Penguin, 2007, anmeldt i Morgenbladet, 6. juni 2008. Mattias Gardell, Bin Laden i våre hjerter, Oslo: Spartacus, 2007, anmeldt i Babylon 6, 1 (2008). "Trender og utviklingstrekk i internasjonal terrorisme etter 11. september 2001", 22. juli-kommisjonen, 17. januar 2012. "Trender og fremtidsutsikter i internasjonal terrorisme", Forsvarspolitisk utvalg, 8. november 2006. Terrorgrupper og kommunikasjon, bakgrunnsdokument for høring om terrorlovgivning i Det danske folketing, 10. mai 2006.